Many people think of television antennas as relics of the past: bunny ears and ugly wires, black and white, and fuzzy snow pictures. So, instead, we’re happy to plop down upwards of $50 (or $85, or $100) a month to get cable, which comes loaded with HD content and (sometimes) high quality programming. Turns out, TV antennas are a lot more useful than most people think: most of the shows people watch are actually available over broadcast networks like FOX, NBC, CBS, and NBC — Boxee says 89 out of the top 100 shows appear on these freely available networks. And soon owners of the Boxee Box will have an easier way to take advantage of them, thanks to a new $49 USB TV tuner that’s being released in January (the feature was first spotted by GigaOm in a leaked software build last week). Plug in the USB stick into the Boxee Box, wire up the antenna, and you’re set — with one more reason to ‘cut the cord’ and rid yourself of your monthly cable bill. Broadcast channels are generally local, so they give you access to your local news programs. They’re also home to the biggest sporting events (Superbowl, The Olympics), political events (like the debates), and so on. And, provided you have adequate reception, an HD channel received over broadcast will actually be higher quality than it would over cable (broadcast content isn’t compressed). There are two potential caveats though. The first is that not everyone can receive broadcast channels, at least for all the networks they want — it’s up to where you live, which direction your attention would be facing and how far it is from a window, and other factors (you’ll probably just need to test it out). 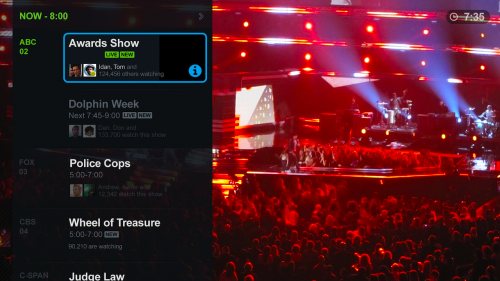 And second: at this point Boxee hasn’t included DVR functionality, so you can’t yet record from over-the-air broadcasts. You can, however, take advantage of Boxee’s social features, and the company has licensed data so that the channels you receive over broadcast are clearly labeled. Boxee CEO Avner Ronen says that the service has 2 million cumulative users, around a quarter of whom are active. Most of the active users are using Boxee’s software installed on a PC or Mac (they can’t use this antenna), but he says the dedicated Boxee Box, which launched a year ago, is the fastest-growing way to use the service. Boxee will make a small amount of money for each USB Tuner and Boxee Box sold, but Ronen says this isn’t the way the business will scale — rather, its longer term vision is to generate revenue through its software.